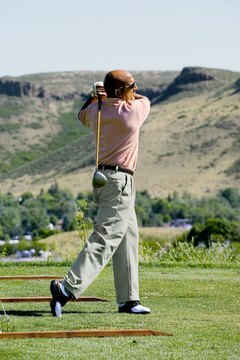 Golfer with a shoulder-width stance. The way you set up your stance can have a direct effect on your golf swing and shot. Amateur golfers too often set up in a position that makes a proper swing difficult to execute. Many of these amateur golfers can eliminate poor swings just by making an adjustment in the positioning of their feet. Positioning your feet correctly will promote the proper balance and hip turn throughout the swing. Both proper balance and hip turn are necessary for making a consistently good swing. Grip the club and step up to the ball with your feet together. Square the clubface to your target before taking your stance, then take a shoulder-width stance and position the ball properly. Position the ball 3 to 4 inches inside the left heel (for a right-handed golfer) for a standard iron shot. Position the ball off the inside of the left heel for a standard driver, 3-wood or 5-wood shot. Align your feet parallel to your target line. Turn your left foot out toward the target about 20 degrees, relative to the target line. This will allow your hips to turn toward the target at impact and during the follow-through. This will also promote a proper weight shift to your left foot on the follow-through. Keep your right foot square, or perpendicular to the target line. This will help you rotate the proper amount with your hips on the backswing. Rotating too much with your hips on the backswing can pull you off balance. Proper foot position at the finish. Establish a 50-50 weight distribution on each foot before taking the club back. Too much weight on one foot will keep you from making a proper weight shift. Center your weight on each foot. You should not be on your toes or heels. 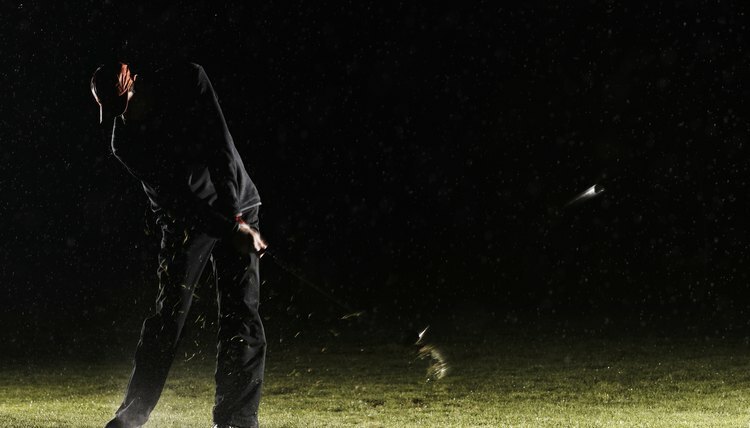 Keep both feet flat as you take the club back. As your hips turn on the backswing the majority of your weight will shift to your right foot. Transfer your weight back to your left foot as you swing down and through the ball to your finish. Finish with your left foot flat and your right heel directly over the toes of your right foot. Your weight should be almost entirely on the left foot at the finish of the golf swing.